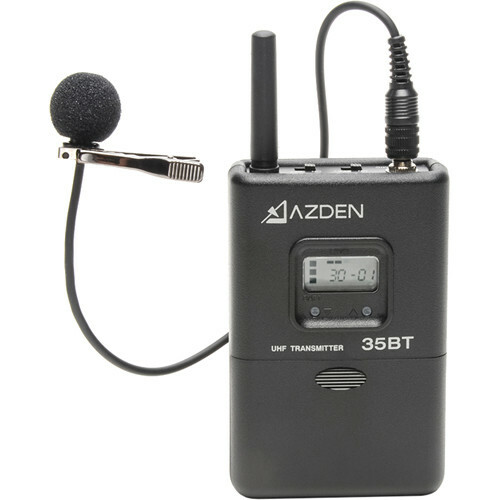 The Azden 35BT Wireless Beltpack Transmitter is intended for use with Azden's 305 series wireless systems. The 35BT beltpack transmitter includes the EX-503 lavalier microphone. Just like the 305UPR receiver, the transmitter features 188 selectable UHF frequencies, LCD display and operates on two AA alkaline batteries. Up to 188 UHF selectable frequencies are provided and ensure a clear channel in any location. The 305-series components all feature intuitive digital displays. Box Dimensions (LxWxH) 9.8 x 3.6 x 2.8"
35BT Portable Wireless Bodypack Transmitter with EX503 Mic is rated 3.8 out of 5 by 5. Rated 4 out of 5 by Anonymous from 35BT Portable Wireless Bodypack Transmit I use this product when producing my local tv show. I have 2 - 35bt portable wireless bodypacks. These are vital to the production of the show as we are always moving and still a fledgling show on a tight budget. For the cost - worth it. For the ease - worth it. Rated 5 out of 5 by Mike S. from The best of the best Never failed me yet! This is not my only one. I own several. is this backwards compatible with a 15bt azden??? The 35BT transmitter is not able to work with the 105 series which requires the 15BT. The 35BT transmitter is only compatible with Azdens 310 or 330 series. Will it work on 800 mhz frequency? The range of this transmitter is 566.125 - 589.875 MHz, so no it will not work at 800 MHz.